Munda (157.26E 8.328S) is located on the south coast of New Georgia in the Solomon Islands chain. It was the location of a coconut plantation prior to the outbreak of war. Elements of 6 Sasebo Special Naval Landing Force swept the area for guerrillas and coast watchers on 13 November 1942 and reported that thre was good ground for an airfield. A week later a rifle company deployed to the area, and on 24 November 1942 the Japanese began construction of an airstrip to support their troops at Guadalcanal, just 175 miles away. Zeros from this airfield would have had enough loiter time over Henderson Field to pose a serious threat to the Americans. To prevent detection, the Japanese replaced each coconut palm as it was removed with fronds suspended from wires. Clever as the ruse was, it failed in the face of Allied intelligence efforts. By 28 November coast watchers had reported the Japanese landing concrete and other construction materials on New Georgia for the airfield. 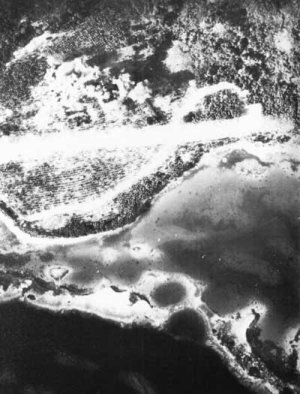 On 3 December a photoreconnaissance mission detected the ruse, and by 5 December the photographic interpreters had located gun emplacements and a 2000-foot runway under the fronds. On 9 December the first B-17 raid took place, but neither this nor subsequent raids was able to prevent the Japanese from basing Zeros on the airfield after completing the first runway on 15 December. The Americans were discovering for themselves what they had already demonstrated to the Japanese, namely, just how hard it was to knock out an airfield. However, the Zeros were so hard-pressed defending their own base that they never had a chance to try to establish air superiority over Henderson Field, and convoys to New Georgia also came under heavy air attack. Munda was heavily bombarded by Task Force 67 (Ainsworth), with three light cruisers and two destroyers, on the night of 4-5 January 1943. The operation was notable as the first time that PBY Catalina "Black Cat" aircraft participated in an operation, providing effective spotting for the bombarding force. The airfield became a target for Allied invasion in June 1943. This led to a protracted battle that forced the Americans to rethink their Solomons strategy. Halsey's next attack would leapfrog Kolombangara to land at weakly defended Vella Lavella, and the pattern of leapfrogging Japanese strongpoints would characterize Allied operations for the remainder of the war.